I have written many book reviews over the decades, but this one means a lot to me. It’s about a book of poetry by my cousin – a friend, a former priest, an editor of an acclaimed Jesuit magazine, America, an appellate attorney in the Criminal Division of the US Department of Justice fighting for social justice for the poor, a writer, and recently, an artist (photo above of Tom Gannon with some of his paintings at an exhibition last year). Tom Gannon is a modern renaissance bloke, a family man, and a serious poet since 2013. Yes, I’m going to write a favourable critique of my cousin Tom’s book, but it has nothing to do with family ties, except that I always knew Tom would publish a book one day. He’s a great writer. When he was an editor for America, I read a few of his pieces and they were always good. The magazine’s offices were in New York City, and occasionally Tom and I would get together for a beer at the student bar near Columbia University at 110th & Broadway on a Friday afternoon after school. The beer was good, the juke box played MacArthur Park and Didn’t We, songs written by Jimmy Webb for the album, A Tramp Shining, sung by the actor Richard Harris. It was 1968. I talked about the difficulties of teaching in a Catholic primary school, Corpus Christi, just up Broadway on 121st Street, one of many 20 somethings working in a disadvantaged area to avoid getting sent to Vietnam. Tom talked about editing the magazine and politics. He didn’t get ordained until 1970, and on the Saturday morning of the ordination, I caught a train from New York to the church in Philadelphia where I jokingly asked the new Father Tom to give me last rites. I had a terrible hangover, a result of a night at the local pub after a week of teaching. As I remember, he gave me his blessing instead. Tom Gannon was a good priest and possessed a professional confessional manner – not that I ever asked him to hear my confession, except I guess unofficially in that Broadway bar – but I wasn’t surprised when he left the priesthood in 1978. He married his childhood sweetheart, Ann, shortly afterward, and they had two children, Mark and Kate, both of whom, you will not be surprised to learn, are now attorneys, living in Washington, DC. The family that studies together stays together. Phillies and Flyers and Eagles. It was not what I thought it to be. In Teaching Method, the memory is about the struggle with Latin suffered by so many students in Catholic high schools. Their goal: to learn Ten new vocabulary words,/A sentence of lofty Roman rhetoric,/Two lines of dactylic hexameter./Not a high bar to get over. How did they do it? It was the teacher’s command at the beginning of each class: “Take out a half-sheet.”/The matters they are quizzed on/Will stay with them./Bet on it. If you were a sports fan in Philly, you lived and mostly died with the Phillies baseball team. One of my favourite poems in this collection is The Man: A Memory. The man is Stan Musial, the Hall of Famer for the St Louis Cardinals, who was facing the Phillies in a twilight double header at Connie Mack Stadium in another neighbourhood of rowhouses. Stan the Man is one of my heroes and I have written about him before, in a review of George Vecsey’s wonderful biography. Gannon’s description of Musial’s game-winning hit is beautiful: He uncoils from his crouch./Bat meets ball with a sharp crack and/The ball rockets though the warm July air/Towards the gap in right center field …/No fly ball this. More like the mother of all line drives. The Phillies’ Del Ennis hits a game-winning grand slam home run in the second half of the doubleheader, more dramatic than the Musial double, writes Gannon. But that line-drive double,/Almost sixty years later/Upon the death of the Man,/Is a memory still to be treasured. Hear, Hear Tom Gannon. Might lead through his lungs? Lest this review get too long, and I wind up quoting every poem, let me concentrate on three of the best. 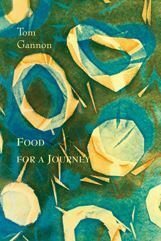 The title poem, Food for a Journey, is a lovely autobiographical reminiscence. It’s about a newly ordained priest, working as an editor on a magazine, who wants more experience with people, when an opportunity emerges to work for two weeks in a hospital. Perfect. He offers Mass, gives Communion to the bed-ridden, hears confessions, but does not have the words to console a single mother/Who has lost her four-year-old son. Then he has to give communion to the most famous football coach in America, Vince Lombardi, who is battling cancer at Georgetown University Hospital in Washington. The priest approaches the room with trepidation, but the coach’s wife sends him away because Lombardi is having a blood transfusion. Soon after, a nurse rushes up to the priest: “Father,” she says, “you have to come back to the coach’s room,/When he found out that his wife had sent you away,/He hit the roof.” The coach is sitting up in bed and says: “We had some trouble, Father,/but we got that straightened out.” The priest gives him a tiny piece of the host, and the coach thanks the novice priest, who returns to his magazine. The final stanza brings it all together: A few days later/The next stage of the coach’s journey begins. Changing Times is a journey through one of the worst political events in American history: the 1968 Democratic National Convention when Chicago Mayor Daley and the city’s police force made sure the worst possible candidate became the party’s presidential nominee. The delegations from New York and California were banished, like unruly children,/to the farthest reaches of the convention floor/To be seen and not heard.The protesters told the police the whole world was watching as the constabulary charged the marchers with riot batons. The poem begins with a young woman sitting at a piano, getting to ready to play … by part two After the beaten and bloody had retreated/into the relative safety of the Hilton; After a senator from Connecticut/Dared to accuse the mayor of/Using Gestapo tactics/on the streets of the mayor’s city; After multiple Johnsonian humiliations of Hubert Humphrey/Turned the vice-president into damaged goods,/Yet culminated in his nomination for/The highest office in the gift of the American people; the young woman started to play for a party that would never be held – The party that would have celebrated/The McCarthy nomination. No need for sheet music. The times, they were a-changin’. For better, for worse? Who knew? Even now, many wars later, who knows? Last, but certainly not least, is Gannon’s piece de resistance, Saddest Words. It reminds me of a poem by the great American writer, Robert Lowell, For the Union Dead, a eulogy to a Civil War hero, Colonel Robert Shaw, and his Massachusetts 54th Regiment, composed entirely of black soldiers. Published in 1960, the poem compares the brave Shaw and his soldiers with present-day Boston and its lack of compassion for the monuments of the past. The monument to the regiment sticks like a fishbone in the city’s throat. Saddest Words pays homage to the soldiers and marines home from America’s most recent wars, now lying in rest in the newest part of the Arlington National Cemetery: Section 60. Gannon uses a series of questions to ask what would have happened if Bill Clinton had not had a sexual liaison with Monica Lewinsky. There would have been no occasion for the President to be impeached, No occasion for thousands of Floridians/To be so offended by presidential tawdriness/That they vote for the man born on third base. George W. Bush, of course. Gannon goes on to imagine what would have happened if the new President (Al Gore) had taken seriously the warning of intelligence agencies about a Saudi Arabian fanatic (Osama bin Laden) and his declaration of war: Those agencies concentrate on a man/ in custody in Minnesota for immigration violations,/a flight school student who wants to learn how to fly large jetliners, but not how to land them. The concentration foils the plot and removes any reason for the invasion of Afghanistan, the invasion of Iraq and Removes any reason for/Cemetery officials to open Section 60. No one dares voice it. For a decade, this feeling. These burials did not have to be. Those are the saddest words from the saddest acre in America. Food for a Journey is food for thought on many subjects. FOOTNOTE: If you want to get a copy of Food for a Journey, you can order it through the publishers, Antrim House, in Simsbury, Connecticut. Here’s a link to the ordering process, plus a biography of Tom and six poems from the book to savour: http://antrimhousebooks.com/gannon.html You can also order it directly from the author on tmgannon46@gmail.com Send Tom an email and he’ll give you the details. You can also click on this link to the Politics and Prose bookshop in Washington, DC, which also has copies of Food for a Journey: http://www.politics-prose.com/book/978-1-936482-33-7. And yes, Amazon.com has copies of the book. The last time I checked, the site said: “8 copies in stock. Order soon.” Enjoy. ← The US presidential election: Only 368 days to go! This is the reply I sent Tom on his new blog/website. It’s worth subscribing to! Hi Tom, Thanks for posting my review. But most of all, thanks for your poems. I hope that readers of your website (which is very good) will buy the book and enjoy it as much as I did. Keep up the quality work! Cheers, Tom PS I keep trying to retire but occasionally a freelance project comes my way.